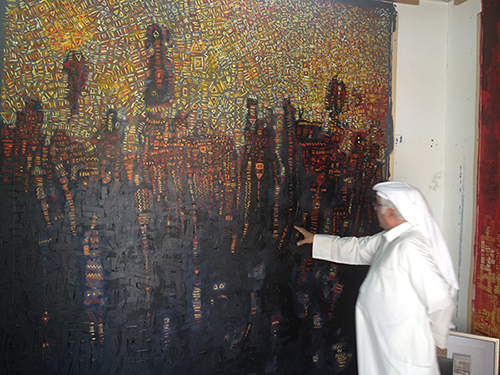 Last year we commissioned Emirati artist Mohammad Al Qassab to create two large-scale paintings for the new Arabic Gallery at Kempinski Hotel Mall of the Emirates. The hotel wanted the exhibition space to provide a dynamic platform for both art and the UAE's cultural heritage, enhancing the experience of their guests. Al Qassab's vibrant, abstract paintings bring together a range of influences drawn from the Emirates' culture and history. His use of intricate geometric shapes and patterns can be traced back to traditional architecture and a popular local fabric called al Sadu. These woven textiles convey many different aspects of Bedouin community life, from the nomadic lifestyle to the desert environment. Al Qassab coupled these elements with a colour palette recalling the Arabian desert at sunset, with inky black forms sharply silhouetted against fiery reds and oranges. More information on Mohammad Al Qassab along with a selection of his limited edition prints can be seen on our website.